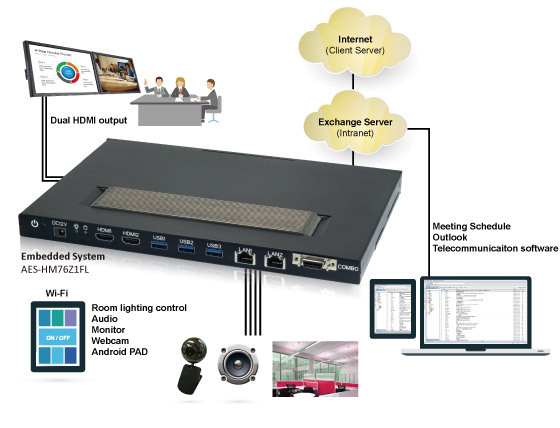 acrosser Technology, a world-leading Industrial computer manufacturer, is pleased to announce that its industrial fanless PC, AES-HM76Z1FL is chosen as the hardware platform from an IT solution company for its latest video conference management machine. The integrated AES-HM76Z1FL supports multiple communication platform and software, including Google Hangouts, Skype, Web-Ex, Blue Jeans, and GoToMeeting. The variety of platforms makes AES-HM76Z1FL an ideal hardware for collaborative media solution. This project integrated cloud computing technology, allowing conference attendees to participate the meeting with their own device. With the flexible system connectivity architecture, this BYOD (Bring Your Own Device) concept eliminates hardware constraints and promotes multi-lateral communication in an economic yet efficient method. By simply connecting a tablet, participants will immediate have a control dashboard to adjust room settings and manage room resources. Besides Intel® Core™ i7, Acrosser’s AES-HM76Z1FL also provides alternative CPU, including Core™ i3 and Celeron to satisfy different needs of computing power. The model is applicable for online video conference among convention rooms, lecturing hall, class room or online training center, powered by video communication software.